"Preparing all students to succeed"
The Human Resources Support Services (HRSS) Staff is responsible for administering the Beginning Teacher Support Program, Licensure Support Services Program, National Board Support Program, North Carolina Educator Effectiveness System, Recruitment Program, Substitute Program, licensed personnel verification and selection procedures, and transfer procedures. The ultimate goal is to recruit, support, and retain a high performing and diverse workforce while assuring a safe and orderly environment for students, employees, and stakeholders. Through strategic partnerships and collaboration, HRSS Staff Members work together in a spirit of continuous improvement and “due diligence” to meet the challenges of a progressive and growing school district in a global community. The slideshow below captures moments from events sponsored by the Human Resources Support Services Department. Enjoy! Dr. Kevin Plue, Forest Hills High Principal, exhibits the pride of Union County Public Schools during a career fair at Western Carolina University. 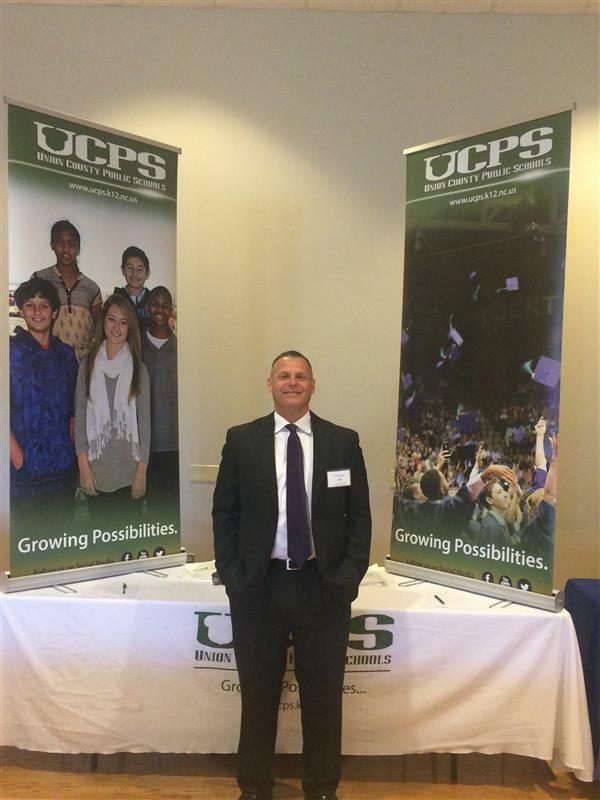 Dr. Plue and other administrators volunteer to serve as recruiters for UCPS. Recruiting on college and university campuses is one of several strategies used to assure that teaching candidates are aware of the career opportunities and amenities of Union County Public Schools. Congratulations to Mrs. Vernell Palmer O'Leary! 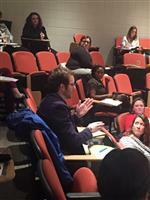 Beginning teachers are taking advantage of leadership opportunities by participating in the Public School Forum of North Carolina Beginning Teacher Network (BTN). Here, UCPS Beginning Teachers are involved in a leadership activity at Wingate University.